In twelfth century England, Gemma de Vere and Nicholas de Reymes find love at a young age. Too naïve to truly understand what is happening, their fledgling relation-ship is torn apart by political games and scheming minds. Nicholas and his family disappear into the night and Gemma is left with a shattered heart. Seven years later, Gemma still harbors a broken heart, and retreats into a life in which she will not be foolish enough to fall in love again. Mysterious deaths and accidents begin to plague those living within the walls of Blackstone Castle, and her father falls ill. She has no choice but to seek the assistance of King Henry. Help arrives in the form of her childhood love, the handsome and imposing Nicholas, who is now a fierce and loyal knight bent on revenge. The pain and anguish he feels over the fate of his family casts Gemma as his enemy. To him, she represents all the misfortune in his life as he tries to keep her at arm’s length and far away from his heart. Their journey towards truth is riddled with treachery and danger from an unlikely source. Will they find their way back to each other, or will his need for revenge out-weigh the love he feels in her arms? Medieval romance (or any historical romance) can be tough simply because you cannot experience the time period on your own. Research is a huge part of putting a story together. While I enjoyed the research, there is a certain amount of guessing involved. There are great resources out there, but most of them do not agree. You have to use the facts that make the most sense or that are found most often to weave authenticity into a story. Just write. Ask for help and advice. Find someone without a personal connection to you (or someone who has no need to please you) to have go at your book and ask them to be honest. Study fiction writing, don’t be afraid to be wrong, and don’t stop. Above all, be willing to learn and always strive to do better. I have always enjoyed reading historical romance and have been writing since I was a kid. I think it was just a natural thing for me to create my own story. At times I think I did it just to see if I could do it. I have put a lot of time into my family tree and my research into my family back in medieval times added to my fascination in with times past. All of these things combined led to A Stormy Knight. On a more sentimental note, in a way my relationship with my husband is inspirational to me. I am still madly in love with him after twenty years and I believe in the power of love overcoming just about anything. Amy Mullen is a freelance writer and romance author living in Corning, NY, with her husband, Patrick, two children, and an orange cat named Steve. 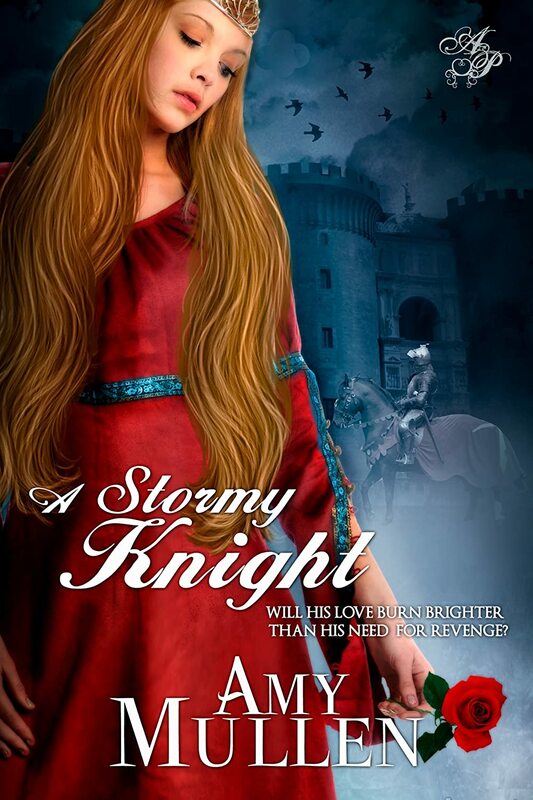 Her first novel is a medieval romance titled “A Stormy Knight.” Amy has been writing about love both lost and regained since she was old enough to have her first broken heart. Her love of history and her intermittent jaunts into amateur genealogy led her to a love affair with writing historical fiction. When not writing, she snaps pictures, enjoys the company of her children, and when time allows, loves to bury her nose in a good book.